Supporting the MIA and National Motorsport Week, M-Sport opened its doors to some of Europe’s most promising and enthusiastic talents this week as 20 aspiring youngsters attended an Engineering Seminar at the company’s headquarters at Dovenby Hall in Cumbria. Supporting National Motorsport Week’s commitment to further increase interest, spectators, competitors and jobs within the multi-million pound UK motorsport industry, the Cumbria-based firm welcomed a host of prospective engineers of varying levels and nationalities. Those in attendance included graduates from the UK as well as from as far afield as Bratislava and Italy; some beginning their first year of university in September, some with degrees and PhDs. 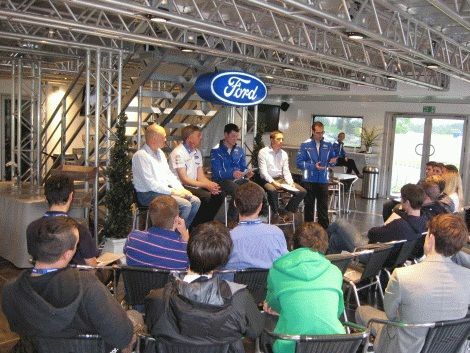 Following an in-depth, behind-the-scenes tour of M-Sport’s state-of-the-art facility, attendees then had the chance to put their questions to some of M-Sport’s most experienced engineers including those specialising in engine, design and race set-up. “It has been an awesome experience. It was very cool to get a very different, one-off insight into a company like M-Sport and see just how much goes into preparing each car before each event. “The team here at M-Sport are so knowledgeable – they know how everything works and why things are the way they are. The knowledge was way beyond what I had expected to gain from the tour and the Q&A with the engineers made me realise that I definitely want to pursue a career in the industry. “The whole day was a great insight into how a motorsport team operates on a daily basis. Especially with the tour of the workshop, you just don’t realise how much preparation goes into each car before an event and I must say a big thanks to all the guys at M-Sport for the opportunity. Northern Ireland Gears Up For National Motorsport Week!